Discussion in 'Mac Programming' started by sembem, Oct 13, 2014. 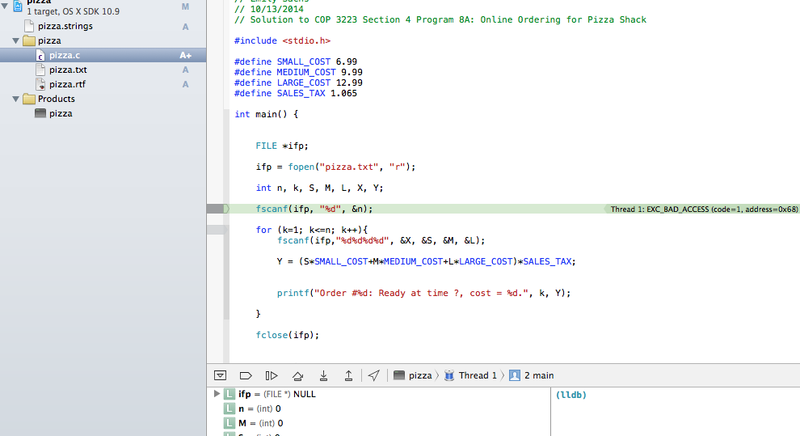 I have an assignment that has to read in numbers from a file ("pizza.txt") and I keep getting the same error in green. Do I have the file in the wrong spot? How do I get it to the right spot? I'm completely new to this, please help! NULL means it doesn't exist. I don't see a path to the file? I'm pretty sure you are getting a NULL because you have not told it to look in the correct area for the file. Thank you I had a feeling that might be it. That being said, I am very new to this, do you know how I can direct it to the proper location? In your code, "pizza.txt" is going to be relative to the current working directory, so you need to set the working directory to the directory where "pizza.txt" is located. Exactly how and where you do that depends on which version of Xcode you have. Also search Xcode's builtin Help (Help menu) for info on using the Scheme Editor. Look under "Options" for a "Working directory" option, for example. Finally, you need to add some code that checks whether ifp is NULL or not after fopen(). If it's NULL, then don't do the loop, because the file you asked for couldn't be opened. These checks are called "error checking". Others have responded to the actual file issue, which is almost certainly caused by pizza.txt being somewhere other than the working directory. So what about the rest? For one, money isn't floating point in most contexts. Change all of your constants at the top and put the value in (), ie (699). Sales tax will need to remain a decimal. Now you can do integer math all the way. Currently you do some double precision math, then truncate the cents when you implicitly cast back to an int. Once you have the total price in cents, you can get the "dollar part" by dividing by 100, and the cents using % 100. The sales tax is a bit of a dilemma because you'll get fractional cents. If you want to deal with this you can, but for this project you can likely truncate and be OK (sometimes you'll be a cent too low). Otherwise, rename every single variable. They are not meaningful. numSmallPizzas means something. s does not. I know you're just starting and this seems overboard, but this is the easiest time to learn things that will save you in more complex programs in the future. The code declares variables as integers( int n, k, S, M, L, X, Y; ). Make sure ( i.e. go back to your instructor and ask or review notes for the lecture about how integers can be used ) you understand how variables are used. An integer variable may only contain a whole number with *no* fractional ( i.e decimal or if using US Dollars, cents ) piece. Lee's suggestion to do all calculations in cents allows integers to be used ( although depending on the size of the numbers larger integer variables such as UInt64 might be required ) but there are other ways. Above all, while you're learning, make sure you can explain to yourself what each line of code does. Copying code and hoping it will work might get through a course but you won't learn as much. Do I have the file in the wrong spot? How would we know? Where did you put it? How do I get it to the right spot? Again, how would we know what "the right spot" is? Did your professor tell you where they want you to put it? As the code is written, it expects the file to be found in the same directory as the executable. Put it there. What does Xcode have to do with it? It's a tool for creating applications. When the application runs, it isn't using Xcode, and so Xcode has nothing to do with run-time file paths. The path the text file needs to be in is different if you built the same source code file in Xcode as compared to the commandline. If you know the answer, why not help the OP and provide it? Hey, not sure if I'm late to the party. Just wanted to say that you should always make sure that you check to make sure a file actually opened. I'm almost certain that would work. I don't remember how C handles files and exceptions. But basically, fopen() should return something. If it's not the value you expect, then something's wrong.. If you were to do this exercise from the Terminal, the code would work as expected. Here you can see the directory I am in, and the files contained. XCode, however, doesn't work that way. If you create a command-line application using the C language and add pizza.txt to that project, the same source code will not work. Let's see if we can find the executable. Nowhere to be found in the project folder. What gives? Let's look around a little bit. Well, there it is. We could move pizza.txt to that location. You can change where the executable goes by going to Project Settings under the File menu in Xcode. 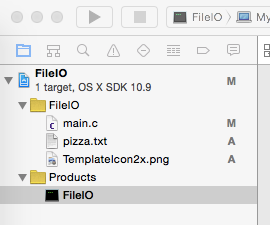 You can also right-click on the program icon under products in XCode to see where the file is. Thank you for doing error checking, sir and answering the question completely. +1 to you, have a good day.